As competition in business increases, offering only good product and services are not enough. Companies must be aware with the importance of involving customer experiences that would differentiate themselves from the competitors (Walls et al, 2011). There is a need to conduct continuous improvement in the way the company gives experience to the customers. For the case of Toyota Indonesia, it will be suggested for the company to conduct the step by step “ten stages road-map” of improving customer experience suggested by Johnston and Kong (2011). The first stage to conduct is the instigation and objective setting. Clear state of motivation of improvement should be formulised due to the fact that motivation across organisation might vary (Johnson and Kong, 2011). The best suggestion to create a clear state motivation of improvement is to clarify the company vision, business model, strategies, and structure. By clarifying these factors, the company could generate a clear motivation of improvement that would be in line with what the company wanted to be. Then second stage emerge where the company could create the business case which could be utilise to better understand their current business condition and spot out factors that might need improvement for better customer satisfaction. The third stage is to coordinate and oversee the changes. In conducting this stage, it is suggested that the company clarify their leadership style and the organizational culture. Due to the condition of Toyota Indonesia in which they tend to be more centralised in term of decision making (every branch will apply the same strategy and process), thus the best way for the company is to create small experienced team which are based in the Indonesian head quarter office when conducting this research project. After conducting the planning and setting the direction step, the company will be ready to conduct the fourth stage which is undertaking customer research. The research should ensure to capture information from a well balance portion of customer spread. It also need to cover information from both their B2B customer (main customers of Toyota trucks and heavy machine) and B2C customer (end user customers) being aware that these different groups of customers would perform different behaviours and needs. Research could be conducted by doing customers survey and interviews. This research should be conducted in order to capture primary data from Toyota Indonesia customers which explains experiential factors that the company gives to the customer and how the customers appreciate these experiential factors. The fifth stage includes defining the experience. Lemke et al (2011, p.857) stated that the seven key customer experience quality constructs for B2B are “extent of personal contact, flexibility, implicit understanding of customer needs, concern to elicit customers objectives, proactively checking that everything is OK, promise fulfilment, and knowledge”. For the B2C, Lemke et al (2011, p.858) stated that there are eight key customer experience quality constructs which are “helpfulness, value for time, customer recognition, promise fulfilment, interest in problem solving, personalization, competence, and accessibility of person/facility”. By conducting the research step, the company expect to change the mindset of the decision maker and staff when they see the perspective from the customer point of view. This will be able to enhance the ability to understand their customers better. When conducting research to understand the customer perspective of the customer experience, from the information gathered, the company could identify the major parts of the experience that are considered poor and good by the customer. The sixth stage is to prioritise areas for development which could be learned from the result of the research. When areas of needed development have been clarified, it is best for the company to ask those involving in process (customer) regarding how to improve the areas for development. Sets of point of view from the customers would generate insight and knowledge for the company regarding how the customer wanted the experience to be. 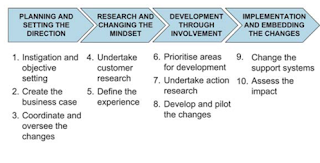 After receiving sets alternative of actions, the seven stages is to undertake action research. This stage is conducted by researching on the process and experiences from the customer point of view that would integrate together to achieve the motivation of improvement, company vision, business model, strategy, and structure. “Emotional mapping was particularly helpful here, also referred to behavioural mapping, which ask staff to map out the customer journey then add what they think the customer feels at each point of the process” (Johnson and Kong, 2011, p.15). The eight stages are to develop and pilot the changes. In this stage, the company is expected to utilise information that has been generated from the researches to develop actions of improvement in giving customer experience. After the suggested action had been approved by the company decision maker, it would be best for the experienced team to lead the implementation of the suggested actions and communicate the plan throughout the organization. The ninth stage is change the support system. When changes in company strategy and action apply, there might be condition where the company would require changes in the infrastructure and resources in order to support the improvement of customer experience actions. Thus, the company should put into consideration whether to modify the available infrastructure or changing the infrastructure completely. Training and development should also be a consideration in planning these actions. Finally it comes to the last stage which is to assess the impact. This can be conducted by analysing the points of changes meaning the areas that the company has conducted several changes in operation. For example, analysing the changes in their cost structure (does the new practices creates greater cost efficiency), or the changes in employees productivity (does the new practices motivates employees to generate greater customer experience). Most importantly is the need of the company to conduct analysis on the impact of the new practices to generate greater customer experiences.